The action-adventure platformer Iconoclasts had already been kicking around for years when we spent seven hours with its "lush Metroidvania-style world" in early 2013, shortly after creator Joakim "Konjak" Sandberg released a new build for that year's Independent Games Festival. But even then, he refused to put a launch date on it. "Will we see its release in 2013?" we wondered at the time. The answer, obviously, was no, as it was for 2014, and is for 2015. But 2016 is looking pretty good. We can say that because Iconoclasts went up on Steam Greenlight today, and its release date is listed as 2016. That's not very precise, but it's more than we've had until now. There's also a new "character trailer" that, while hardly painting a full picture of what the game has in store, looks really impressive. The Steam description is comparably ambitious, yet vague. "Robin is a mechanic, just like her father. She likes nothing more than to help people keep their machines in order. There’s just one minor problem: She’s unauthorized. That makes her an abomination in the eyes of One Concern, the militaristic governing religion attempting to maintain power over Robin’s home world," it says. "After instigating a series of unfortunate events in her home town, Robin must venture into a beautiful, hostile and frequently odd world. Along the way Robin and her pirate companion Mina, meets a colourful cast of oddballs, misfits, philosophers and sadists – all somehow connected to One Concern and the fate of the world." 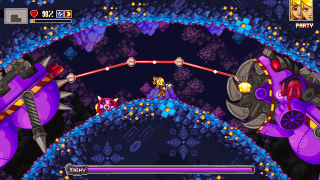 A playable alpha version of Iconoclasts is available, and while it's from 2012 and thus probably shouldn't be taken as representative of the final product, it's plenty playable. And it's free, too, which is a pretty big plus in my book. Grab it at Konjak.org.